Vacation Boat Rentals is located in the majestic Florida Keys. Our office is in the city of Marathon Florida. Our rental fleet has many different varieties of fishing and recreational boats that are available for you to rent. 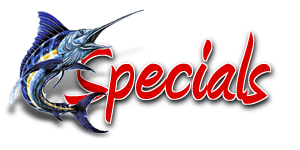 We have Carolina skiff, SeaChasers, Cobias, Southwind Deck boat, ProKats, WorldCats, Parkers, Sailfish, SeaCat, Cape Horns and Grady Whites to choose from. To view our available boats click here. Captain Bob is very proud of his rental boat fleet and very pleased to offer you a very well maintained fleet of rental boats for your vacation needs. Owner Captain Bob Robinson has been fishing the Florida Keys since 1971 catching the big game fish. With the ever growing popularity of the Florida Keys and fishing the Florida Keys he started the boat rental company Vacation Boat Rentals. His desire was to put his extensive knowledge and experience of fishing the Florida Keys to good use in helping others enjoy the sport. Learn more about fishing techniques in the Florida Keys; Captain Bob will share some of his favorites with you. Our office is located in Marathon Florida in the heart of the Florida Keys where we experience some of the best fishing in the world. Vacation Boat Rentals is a company that is fiercely dedicated to our customers. We focus on the little things that make the difference between good and great. That is why we are the #1 boat rental company in the State of Florida. VACATION BOAT RENTALS - The boat rental company built by our customers!